Placing an order for over £500? A man doesn't work for his enemies unless he has little choice in the matter.' So says Bernie Gunther. It is 1954 and Bernie is in Cuba. Tiring of his increasingly dangerous work spying on Meyer Lansky, Bernie acquires a boat and a beautiful companion and quits the island. But the US Navy has other ideas, and soon he finds himself in a place with which he is all too familiar - a prison cell. After exhaustive questioning, he is flown back to Berlin and yet another prison cell with a proposition: work for French intelligence or hang for murder. The job is simple: he is to meet and greet POWs returning to Germany and to look out for one in particular, a French war criminal and member of the French SS who has been posing as a German Wehrmacht officer. The French are anxious to catch up with this man and deal with him in their own ruthless way. But Bernie's past as a German POW in Russia is about to catch up with him - in a way he could never have foreseen. 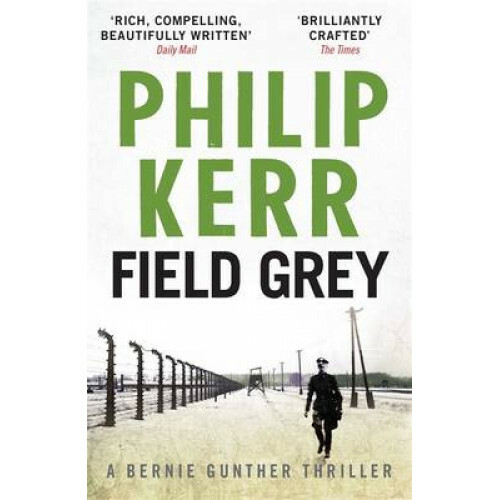 Bernie Gunther's seventh outing delivers more of the fast-paced and quick-witted action that we have come to expect from Philip Kerr. Set in Cuba, a Soviet POW camp, Paris and Berlin, and ranging over a period of twenty years from the Thirties to the Fifties, Field Grey is an outstanding thriller by a writer at the top of his game. Philip Kerr is the author of ten internationally bestselling Bernie Gunther novels. If the Dead Rise Not won the CWA Ellis Peters Award for Best Historical Novel. His other books include several stand-alone thrillers and acclaimed series for children. He lives in south-west London. Abebooks - Abebooks have millions of new & out of print books. Amazon.co.uk - Seattle based book retailer. GoodReads - Good book community with millions of reviews. Google Books - Offer book previews etc, also links to ebooks. WorldCat - Useful for checking book availability in libraries etc. Completely FREE saver delivery is offered for all orders. Typical delivery time is 3 working days after dispatch. Faster delivery options available at checkout. Please note items may dispatch in separate or combined shipments when purchasing multiple items, also that tracking may or may not be available as we use a range of postal delivery companies and couriers. Delivery is estimated at 1-3 working days after dispatch (depending upon options chosen at checkout) PLUS the "Availability" time estimate given in the product price section at the top of the page. Ex. if this states "Usually Dispatched Within 1 Working Day" and you order at 11am the delivery estimate would be 3 days. Orders from 6pm for example wouldn't process that day so delivery estimate would be 4 days. Also please note that we do not dispatch on the weekend and do not class these as working days. Completely FREE saver worldwide delivery is offered for most orders. Please note items may dispatch in separate shipments. Booksplea.se reserve the right to cancel or amend orders which incur a loss for Booksplea.se. Customers located in one country selecting delivery to an alternative country may see delivery charges added at checkout. What if my order hasn't dispatched within the dispatch time estimate? Sorry if this occurs with your order - we are still processing the order and will dispatch ASAP. Typically any delays encountered are for just a 24 hour period. If you wish to cancel the order & source elsewhere please contact us. What if my shipment is overdue? In the event of 15 working days (25 for non UK customers) passing from the point of dispatch with no goods being received we will confirm the delivery address with yourself and normally would either dispatch a replacement shipment or issue a refund. To return your product, you should mail your product to: Booksplea.se, Aphrohead Ltd, 277a Wennington Rd, Southport, PR9 7TW, United Kingdom. You will be responsible for paying for your own shipping costs for returning your item if we are not at fault - If needed a freepost return address can be given for any defective or incorrect product, please contact us if this is the case. If you are shipping an item over £75, you should consider using a trackable shipping service or purchasing shipping insurance. We don't guarantee that we will receive your returned item. Our Returns policy lasts 30 days from the date of delivery. If 30 days have gone by since your delivery date, unfortunately we can't offer you a refund or exchange. To be eligible for a return reasonable care must be taken to return the goods in the condition received. Ideally this would be returned in the original packaging. Once your return is received and inspected, we will send you an email to notify you that we have received your returned item. We will also notify you of the approval or rejection of your refund. If you are approved, then your refund will be processed, and a credit will automatically be applied to your credit card or original method of payment, within a certain amount of days. Late or missing refunds (if applicable) If you haven't received a refund yet, first check your bank account, there is often some processing time before a refund is showing in your account. If you've done this and you still have not received your refund yet, please contact us at sales@booksplea.se. Why is next day delivery not available? As the site gets bigger it will be but we don't have sufficient volume to offer this currently. Can I collect from your warehouse? No sorry. We are internet trading only, previously we did have a bookshop where this was possible. How can I enter a coupon code? On the cart page under the "Use A Coupon" tab. Do you guarantee delivery by a particular date? No we don't sorry - we ship to over 100 countries through many different carriers and cannot offer a guarantee that your order will arrive within a particular timeframe. Sorry this isn't available for smaller orders (under £250), the costs of telephone staff don't cover the extra sales generated. Do you have fly fishing by JR Hartley? Sorry out of stock - if it's not for sale on the site we don't have it. We may add the ability to pre-order titles in the future. Are all items held in stock? Not all - we have over £900,000 of stock in our warehouse but would need tens of millions of pounds worth of inventory to have just 1 copy of everything for sale on the site. We place daily orders with in excess of 100 publishers and wholesalers who typically deliver into us next day. Also please note if placing a larger order the delivery time frame may slightly increase due to the need to possibly source titles from multiple suppliers. Please note this is the same model used by nearly all online booksellers. I'm pleased with your service and want to leave a review of your site? Please if you are so inclined leave a review on Google. We seem to have picked up 6 bad reviews and just 4 good ones (from over 170k orders under the booksplease name). Hardly anyone leaves a review for us on there but this is the first thing you see googling our name so we rely on happy customers helping us out. I've never ordered off you is it safe? Why is it a good deal to buy books from Booksplease?